OSHA inspections can create panic in every safety manager. Relax. An OSHA Enforcement Manager responds to 18 questions on inspections, revealing the facts. Gary Beck, Enforcement Manager of Oregon OSHA, explains what any company owner or safety manager should expect during a safety inspection. Dan Clark interviews Gary on how to prepare for their surprise appearances, and how keeping workers safe is OSHA’s reason for being there. Many other questions about facility safety and signs are answered by Gary. Topics include hazard communication, NFPA, GHS, confined space, ArcFlash and more. Gary Beck: I don’t think they should be feared. I think a lot of it is fear of the unknown. Dan Clark: So you’re having an OSHA inspection! What? When? What do I do? Hi there. I’m Dan Clark with the Creative Safety Supply podcast and today we’re talking with Gary Beck, Enforcement Manager for OSHA of Oregon. Yes, a real, live OSHA person. And I don’t think he’s as scary as some might think. Hello, Gary. Gary: Thanks for inviting me, Dan. Dan: Do first-time safety managers’ knees knock just before their first OSHA inspection? Gary: Ah, I don’t think they should. I think we try and make it as easy as we can on the employers and the safety managers when we go out there. But one thing we cannot do is we cannot call and make an appointment. We’re not allowed to do that. Dan: What do they do when you show up? Gary: We’re not allowed to provide advanced notice, so yes, they just show up at the door. The compliance officer’s going to ask to speak with somebody in management, or whoever’s head at that location where they’re at, meet with them, show them identification, and then explain why they’re there. What’s the purpose, nature and scope of the inspection? Why are we here, what are we going to do, and what are we going to look at? Dan: Uh-huh. And some of these are regular inspections, and some are from because of a whistleblower. Gary: Yes, a lot of times we, ah, have what we call “complaint inspections” and that’s where an employee, or somebody else, has filed a complaint with us about safety hazards. And that’s what we’ll—at the opening conference is what we call it when we first show up—we’ll go over and explain “this is why we’re here. We got this complaint on this item.” We don’t reveal who the complainant is because identity is protected by law. It was a complaint and that’s why we’re here or you just came up on a regular scheduling list, and we’re going to do a comprehensive inspection. If it’s a complaint, we’re just a look at the items normally that are on the complaint. Dan: Unless you see something totally out of bounds… you have to report that as well, right? Gary: If the compliance officer observes a “serious hazard”, they are also going to address that. And if there’s a violation, they will cite that. If they see something that we consider “other-than-serious hazard,” which is something that isn’t going to cause a serious injury, then they’re going to make you aware of that, but they’re not going to cite it. Dan: Well, I know that sometimes seasoned veterans don’t even know what to expect on an OSHA inspection. They don’t, maybe, know the rules—even though they’ve been in a position of being safety manager or manager for a long time—and I’ll get to some of their questions it a bit. What should a safety manager expect during an inspection, whether it’s a tip off, or if it’s a just a regular inspection? Gary: Well, like I say, the first thing, the compliance officer’s going to meet with them, ask if there’s a employee representative for the company, if the represented by the union, or if they have somebody that the safety committee has identified. And they’re going to hold an opening conference and go through everything that’s going to be going on with the inspection, and why they’re there. They’re also going to ask to see any different programs or injury and illness records that might relate to the inspection. They’re always going to look at injury and illness records, but they’re also going to be looking, most of the time, at hazard communication program, lockout/tagout, if it applies, safety committee records, things like that. Once they go over that, then they’ll go and do a walk around of the facility to see if there’s, ah, hazards that they can identify out there. Dan: I know it’s tough to generalize, but what is the main violation that you see that puts the workers in danger? Gary: On the general industry side of things we see a lot of electrical violations, exposed live wiring in different situations. We see a lot of unguarded saws, a lot of unguarded belts, pullies and chains. Also, another big one is grinders, without having the work rest or the guard in front. Dan: So a lot of moving parts that are not particularly safe. Gary: Right. A lot of moving parts that people can get caught in, in point of operation on different pieces of equipment that aren’t guarded. Dan: Have you ever seen safety violations so bad that you actually had to shut down the facility during the inspection? Gary: No, I have been here for over 23 and half years, and with the Enforcement Section that whole time, and I’m not aware of a time where we have shut down a facility. We do have the authority to stop a process if we think it is so dangerous, at that time, until they correct it. Normally, we deal with that on construction sites. If somebody’s exposed to a very hazardous fall, we’ll say “Hey, wait a minute. You can’t go back up there until you provide some type of protection.” Or we might see it on a certain piece of machinery. We’ll say “Hey, you need to do this a little bit different” and make sure the employee’s not exposed. But, normally we don’t shut down the process. We’ll work with the employer, at the end of the inspection establish an abatement date by which violations have to be corrected, and they do that for every violation. The more serious the violation, the sooner we’re going to want it corrected. Dan: Has anybody been tagged for a violation, and then they said “ah, I’m not going to worry about it,” and then a worker was injured because of that? The violation and penalties increase a whole lot, on a failure to abate, if they haven’t fixed something they’re supposed to. Now, if they haven’t fixed it and somebody gets hurt, there’s always the possibility we could be looking at a willful violation. And the penalties really increase then. Dan: Probably, most companies then observe the rules just because they don’t want to get tagged with the high violation fees. Gary: Well, they observe them for that, and, plus, most employers don’t want to hurt their own employees. They’re not trying to be in violation. Sometimes they don’t recognize that something is a hazard or because they’re around it all the time. So, when we point it out they’re usually very good about getting it fixed, because they don’t want to hurt their employees. But, also along the same lines, if they don’t fix it, the penalties could get higher. And there’s other liabilities they could be exposed to. Dan: Okay, good. OSHA inspections are often dreaded. So they’re not such a burden, how should companies actually prepare for them? Even though they won’t know that the inspection’s coming, it seems like they should always be prepared. Gary: Yes, before you ever get going, before we ever show up, have identified who’s going to be representing the employer, if OSHA does show up, and who’s going to be representing the employees. If you have a safety committee, if they’ve elected somebody to represent the employees during an inspection, then have that identified before we ever get out there. And then the other thing is, if whoever those people are, know where the different programs—hazard communication, confined space, the injury and illness records—know where those are so that you don’t have to spend a lot of time trying to run those down, or have access to them, at least. And then just don’t panic when we show up. We’re not coming out there to try and create problems, we’re trying to make it better workplace for everybody. Gary: Another thing they can do is they can request consultation, through our consultative services which is a service that’s free of charge. Just about every one of our consultants is a former compliance officer and they come out there and help you set up different programs, evaluate your workplace, identify hazards, basically prepare you for an inspection. Dan: These people are retired people that, ah, had worked with OSHA before? Gary: No, they’re actually our employees. They’re OSHA employees. Gary: So, it’s a free service that they call up and have to request it. We have staff that go out there and evaluate it. No citations get issued, and help them set up programs. Dan: Well, that phrase right there, “no citations get issued” was a key one, I think (laughs). Dan: Well, let’s get to some of these questions that we often get from employers. They call up and ask all these questions about what kind of labeling they should have, and maybe you could help us out. Dan: Let’s do a rapid-fire thing. “When doing arc flash labeling, do we need all of the information or do we need to just warn that the presence of an arc flash hazard exists? Gary: Our rules don’t have any requirements as far as that. That comes from the NFPA 70 E, but basically you just have to identify that there’s an arc flash hazard. Gary: No it is not. They’re two separate things. 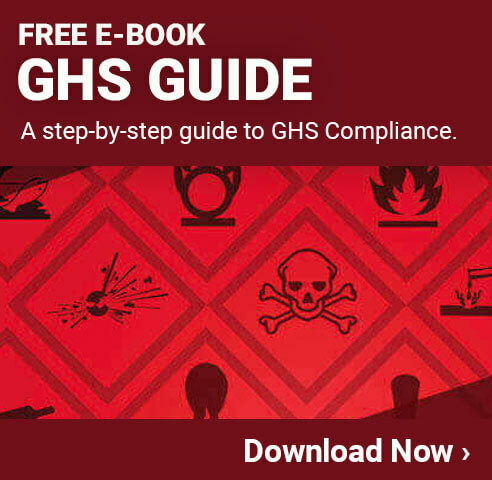 The GHS is the old, what we called “hazard communication”— it’s still hazard communication—but they’re two completely different things. GHS is not replacing NFPA. They’re just two different things. Gary: Only the first one and then any others, whenever there’s a change or update, you need to send them again. So, the first one and then anytime there’s a change after that. Dan: Just the change. Okay. Gary: Ahh, no. There’s not really a standard format. There are some requirements for, ah, identifying on the tag—information on there—but they can be done different ways. Just as long as you can look at it and know who tagged it out, and that it’s locked out. That’s all we require. Gary: Is this for lockout/tagout, or…? Dan: Oh, just in general. Gary: In most cases just two-colored signs, as long as it’s something the people can see and identify. But, it depends on—some rules might have some requirements where it says specifically “this is the color of sign and what it has to be” for certain types of hazards. Gary: In general, as long as it’s legible, we’re okay with it. Gary: As long as it’s legible, we’re okay with it. Gary: We do not have any rules or requirements on the sizes of signs. The closest we come is, we make some reference to the ANSI standard Z53.1, which is the American National Standard on Safety Color Code for marking physical hazards. That gives some guidance on signs, but in our rules themselves, we do not have any specific requirements on the size of signs. Dan: Okay. Now, we’re just about out of time. Before we go, I want to ask you about how the perception is, out there, of the OSHA inspector. They’re feared, they’re vilified. Ah, any final thoughts on how we can change that perception? Gary: I don’t think they should be feared. I think a lot of it is fear of the unknown. Gary: If they haven’t ever been inspected before they’re, kind of, afraid of what to expect. Most of our inspectors, they’re not out there to try and scare anybody or intimidate them. They’re out there to try and work with the employer to provide a safe workplace. Don’t believe all those horror stories you’ve heard in the past. Our compliance officers are good people, they go out there to do their job. They’re focused on protecting the employees and providing a safe workplace, and they’re very good about working with the employer on ways to correct violations and eliminate hazards. Dan: Well, ah, thanks very much. Our guest has been Gary Beck, Enforcement Manager for OSHA of Oregon. Thanks for joining us, Gary. Gary: You’re welcome and thanks for inviting me.